When water initially falls from the sky, and if the skies were free of pollution, and if you could somehow get that water before it touched anything, it would be very pure. But unless you are willing to fly across the heavens with a little cup in each hand, collecting rain drops, you may have to just rely on good old tap water, or bottled water. Either way, these waters come from somewhere. Depending on how many layers of rock water has seeped through and how long it sat, it might be heavy in dissolved minerals, thus becoming “hard water“. If water comes from a pond, a lot of dead leaves might be decaying in it, adding a lot of acidity to the water, which becomes “soft water“ (another way of saying acid water). OK, so let’s recap: Lots of mineral in suspension = hard water = high PH. Can you “see” PH? No. How can you tell if your local tap water has or has not a lot of mineral dissolved in it? By getting a small PH test kit. They are cheap and a must have. They come with a little glass tube (which you fill with the water you want to test) and a bottle of indicator liquid. You add 3 drops in the tube, shake well and watch the color change. They you will know if you are pregnant or not. :)) Just kidding. There’s a chart in there so you can compare your tube color to the chart and it will tell you where the PH is at. A neutral PH (7.0)(neither hard nor acid) turns the tube to a greenish blue color. And is also your ideal water balance. If you live in Southern California as I do, your test tube will turn a very dark, deep blue. Not good. That means your PH is very high (water is hard, full of minerals in suspension). Ph where I live is around 8.2. :(((( In some area of the country however, your tube might turn yellow, which indicates a soft water (PH= 6.0). The chart goes from 6.0 to 8.0. Most tropical fish need 7.0 (neutral) PH or less. Bettas are a little more lenient as I said. If you can have your PH at 7.0 then do by all means. How? The better test kits come with two bottles, one called PH up and one called PH down. You add drops from the PH down bottle to bring a high PH down (I add 10 drops per 2 1/2 gal of water) or add PH up to bring up a low PH. So as you can see, even though PH is invisible to you, you can measure it and adjust it. ANY ADJUSTMENT SHOULD BE DONE VERY GRADUALLY (see bottom). Fish are very sensitive to any changes in their water!! So watch out!! Also be aware that adding too much PH down can burn the bettas, since PH down is, in essence, acid. So never add more than one teaspoon of PH down per 10 gal. 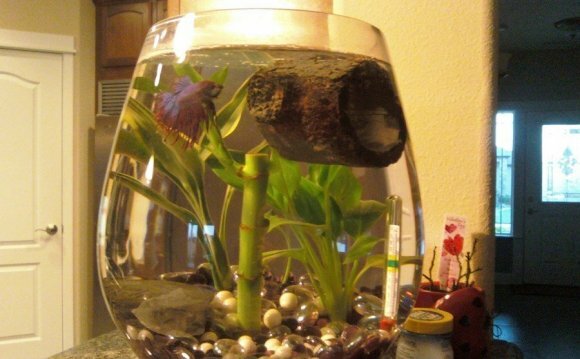 If after a teaspoon of PH down, your water still has a high PH, then leave it at that, your bettas will adapt. Or you may elect to blend your tap water with a bit of distilled water or R/O water to take safely bring the PH and hardness levels down. Water temperature. Fish are very sensitive to temperature changes as well. Tropical fish live in temperatures ranging from 75F to 82F hence the need for a good heater to keep the water warm. If kept in less than 5 gal tanks you cannot use heaters, they might heat up the water too fast and cook your fish. Instead, keep your jars in a warm room. Don’t be cheap when it comes to heaters. A bad heater can KILL all your fish. Spend a few extra buck and get something reliable. Anytime you move a fish, make sure to float his bag/cup to even out the temperatures (see ““). ). A good thermometer is a must too, because heaters can be temperamental so you need to keep an eye on them. Bettas will quickly die if exposed to extreme temps such as anything below 56F or above 95F. They can survive if exposed TEMPORARILY to low temps between 56F and 65FF or high temps between 85F and 95F.